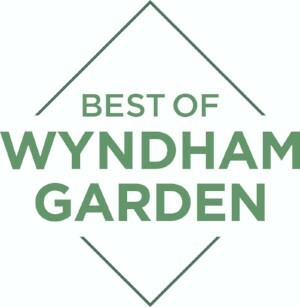 Wyndham Garden Buffalo Williamsville announced today it has been named A Best Wyndham Garden Hotel 2017 by the Wyndham Hotel Group® brand. A distinction awarded to a Wyndham Garden Hotel demonstrating outstanding execution in each of the following categories: superior accommodations, excellent evaluation scores, exceptional guest satisfaction and positive operating performance. Great hotels and teams that bring the spirit of hospitality to life – owners, operators and staff – fuel the success of the Wyndham Garden® brand around the world. Without a doubt, hotels like yours drive ultimate guest satisfaction and, as a result, we’re honored to recognize you and your team for your excellence in 2017 and name you a Best of Wyndham Garden Hotel. And, what’s more, hundreds of guests now enjoy the magic of Wyndham Rewards® thanks to your on-site enrollment efforts! In 2014, Wyndham Garden Buffalo Williamsville was named Hotel of the Year by Wyndham Hotels and Resorts, a distinction honoring the hotel’s excellence in quality and performance, at Wyndham Hotel Group’s 2015 Global Conference. Known for offering upscale hotel accommodations, Wyndham Hotel Group is the world’s largest and most diverse hotel company, with a global portfolio encompassing approximately 8,000 hotels and more than 600,000 rooms in 66 countries under fifteen hotel brands, the perfectly located hotels let travelers discover comfort wherever they are. Additional information and reservations for all Wyndham Hotels are available by visiting www.wyndham.com. Travelers have the opportunity to earn and redeem points through Wyndham Rewards®, the brand’s guest loyalty program, which can be joined for free at www.wyndhamrewards.com. Take a look at the newest additions throughout the United States, Canada, Mexico, Central and South America, the Caribbean, Europe, the Middle East and China. www.wyndhamworldwide.com.